Tin Ka Ping, born in 1919 in Meizhou, Dapu county, Guangdong province, is a renowned Chinese entrepreneur and philanthropist in Hong Kong. He was brought up with a modest family education. After achieving business success, he devoted himself to social welfare and charity and made huge donations to help education and medical services. He serves as a model overseas Chinese entrepreneur. Tin’s father passed away when he was only 16. As a result, he dropped out of school and began to operate Guangtaixing, a company his father established. Before 1956, he moved to Indonesia to launch several businesses. 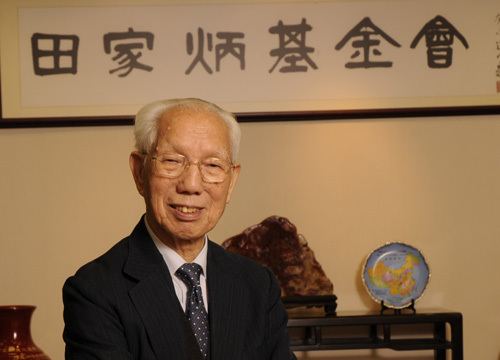 In 1958, he shifted his business focus to Hong Kong by setting up plastics and chemicals plants in the region, becoming the largest polyurethane producer in Hong Kong and Southeast Asia. He then expanded his business into the real estate industry. In 1982, he established the Tin Ka Ping Foundation in Hong Kong. In 1984, Tin retired from enterprise business and devoted himself fully to social welfare and charity. During the next three decades, he contributed greatly to education. Ninety percent of his donations were given to education. Tin does not seek to amass larger and larger fortunes in business. His greater goal is to help the weak and push social progress. In 1982, he won the British Queen’s Badge of Honour. In 1993, a small asteroid, coded 2886, was named the Tin Ka Ping star by the Purple Mountain Observatory. In 1994, the American Global University and Hong Kong Baptist University conferred honorary doctorate degrees to him, and the University of Hong Kong conferred him an academic title. In the mainland, more than 30 provinces, cities and counties recognize him as their honorary resident, and more than 10 universities have invited him to teach as an honorary professor. In 1996, he was awarded the Member British Empire (MBE) medal. On July 1, 2010, he received the Great Bauhinia Medal, the highest level medal conferred by the Hong Kong Special Administrative Region government.